Amazon's Kindle is a great e-reader. The Kindle Fire brings a backlit color touch screen - and the power of an Android tablet - to the table. Some of the early reviews of the Kindle Fire seem to fault it for not being a better tablet. In my opinion, they're looking at it the wrong way. 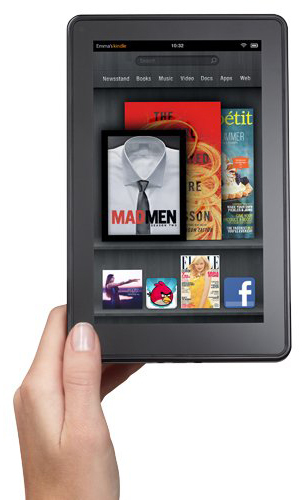 The Kindle Fire is first, and foremost, a Kindle. It's a device designed for reading. And particularly for reading, it's a great experience. The device, while not as light as a feather, it is certainly light enough to be held comfortably for long periods of time. The display is clean, bright, and crisp, and - for the first time in a Kindle device - in color. The touch screen makes navigation while reading easy and intuitive. The Kindle feels solid & substantial - more so, I have to say, than the previous Kindle devices. Reading's comfortable, the Kindle store well stocked, and I find myself reading more than ever. It really is, in my opinion, the best Kindle ever. I'm sure you've seen the ads that show Angry Birds on the Kindle Fire. In fact, I think it's on just about every photograph that Amazon makes available for it. The Kindle does run a version of the Android operating system popular for both cellular phones and tablets. As a result, besides just being a great reading device, it's actually a powerful tablet computer as well. There's a full-fledged web browser, in which I've been accessing my email via Google, Facebook, IMDB (handy when you're watching a movie! ), and of course, Ask Leo!. I've installed and run applications like Evernote, Dropbox, LastPass, TeamViewer, Trillian (an Instant Messaging program), and "AndroXplorer", an Android equivalent to Windows Explorer. The Kindle comes pre-installed with applications or download shortcuts for things like Pandora, Amazon (of course), ESPN, the Weather Channel, Audible, Angry Birds, and more. So far, I've resisted Angry Birds. While it might fall short in comparison to general purpose tablets like the iPad or other Android equivalents - typically in terms of screen size and perhaps horsepower - ultimately, it's a very capable device. It's what I throw in my pocket when I leave the house these days. The biggest complaint that I hear is one that I must agree with - the user interface can be a little "touchy", if you'll pardon the pun. By that, I mean that when you begin using the device, it's somewhat easy to tap to do something and not have it take effect. The biggest example is the "album view" of recently accessed books and applications on the home screen itself. You touch and drag left or right to browser through the view, and then tap the item you want to open. It's easy for Kindle not to recognize that tap. The device ends up training you on how best to touch it. That's backwards to me. While the problem is most pronounced with the scrolling album display, it can occasionally manifests elsewhere as well. The power button is on the bottom of the device. That sounds benign until you put the device in your lap or on your leg and it slides down ... pressing the power button and turning the Kindle off. Because the screen auto-rotates for most applications (most noticeably not the unlock screen), I simply use it upside down. The Kindle Fire is a WiFi-only device - meaning you'll need to be somewhere with an available WiFi connection that you can connect to. I was, however, impressed at its ability to identify the interstitial capture pages on which you need to agree to terms of service before using most open WiFi hotspots. I am a member of Amazon's affiliate program, and that means if you click one of the links on my site and end up purchasing the product, I might make a little money. This doesn't affect the price that you pay. It also didn't affect my decision to recommend this product. I've more to say on that in my full affiliate disclosure. It's a glossy screen - so glare can be an issue in bright light (but conversely, you'll be able to read with the lights out - not something you can do on the older Kindle models). And like most touchpads, it shows finger smears pretty quickly. Grab a micro-fiber cloth to clean it (I now have several), or simply ignore it, as I more often do - the display is definitely bright enough to punch through a little grime without affecting your comfort in reading. The battery life naturally depends on your use. Because it has an actively lit display, it does use more power than it's e-ink predecessors. I'm finding that I want to recharge it every day or two. That's still better than my phone, also an Android device, which can't last a full day without a recharge. I'll be honest - if you want a tablet, you should probably get a tablet. Typically, it's the larger screen and some other features that those looking for tablets want. Make sure it's an Android or iPad device and you can download the Kindle software for free. On the other hand, if you're looking for a great, portable device on which to read - books, documents, web pages, and more - that also happens to be a pretty capable tablet computer as well, then the Kindle Fire may well be exactly what you're looking for. Kindle - Much more than an electronic portable book reader The Kindle reader from Amazon is changing the way many people read. An overlooked capability makes Kindle much more than just a reading device. So, what do you think about Kindle? Amazon's new Kindle electronic book reader has some truly compelling features, several issues and a few surprises. It may change the way I read books. i have a second generation kindle that i am absolutely in love with and have wanted to upgrade to a tablet or an ipad. Then i heard about the Fire-I've been on the fence about getting one, but after reading this, i'll have to gift one to myself if i don't get one for Christmas. I have had 2 kindles within 10 months both crash on a regular basis, they reload eventually. The 1st unit often took 2 or 3 days the 2nd unit does it within minutes. I would never recomend a Kindle ever, I take more care than with a lead crystal wine glass, always place them and carry them by hand if possible or in a padded compartment. Carrying them as if a child. I will never buy another, I bought this for holidays and virtually never use he unit because scared to drop or damage the item. I will use a PC or tablet in future.